Patients treated with REMICADE® are at increased risk for developing serious infections that may lead to hospitalization or death [see Warnings and Precautions (5.1) and Adverse Reactions (6.1)]. Most patients who developed these infections were taking concomitant immunosuppressants such as methotrexate or corticosteroids. Lymphoma and other malignancies, some fatal, have been reported in children and adolescent patients treated with TNF blockers, including REMICADE [see Warnings and Precautions (5.2)]. These highlights do not include all the information needed to use REMICADE ® safely and effectively. See full prescribing information for REMICADE. Increased risk of serious infections leading to hospitalization or death, including tuberculosis (TB), bacterial sepsis, invasive fungal infections (such as histoplasmosis) and infections due to other opportunistic pathogens. Discontinue REMICADE if a patient develops a serious infection. Lymphoma and other malignancies, some fatal, have been reported in children and adolescent patients treated with tumor necrosis factor (TNF) blockers, including REMICADE. REMICADE is administered by intravenous infusion over a period of not less than 2 hours. REMICADE is indicated for reducing signs and symptoms and inducing and maintaining clinical remission in adult patients with moderately to severely active Crohn's disease who have had an inadequate response to conventional therapy. REMICADE is indicated for reducing the number of draining enterocutaneous and rectovaginal fistulas and maintaining fistula closure in adult patients with fistulizing Crohn's disease. REMICADE is indicated for reducing signs and symptoms and inducing and maintaining clinical remission in pediatric patients 6 years of age and older with moderately to severely active Crohn's disease who have had an inadequate response to conventional therapy. REMICADE is indicated for the treatment of adult patients with chronic severe (i.e., extensive and/or disabling) plaque psoriasis who are candidates for systemic therapy and when other systemic therapies are medically less appropriate. REMICADE should only be administered to patients who will be closely monitored and have regular follow-up visits with a physician [see Boxed Warning, Warnings and Precautions (5)]. The recommended dose of REMICADE is 3 mg/kg given as an intravenous induction regimen at 0, 2 and 6 weeks followed by a maintenance regimen of 3 mg/kg every 8 weeks thereafter for the treatment of moderately to severely active rheumatoid arthritis. REMICADE should be given in combination with methotrexate. For patients who have an incomplete response, consideration may be given to adjusting the dose up to 10 mg/kg or treating as often as every 4 weeks bearing in mind that risk of serious infections is increased at higher doses [see Adverse Reactions (6.1)]. Prior to initiating REMICADE and periodically during therapy, patients should be evaluated for active tuberculosis and tested for latent infection [see Warnings and Precautions (5.1)]. Adverse effects during administration of REMICADE have included flu-like symptoms, headache, dyspnea, hypotension, transient fever, chills, gastrointestinal symptoms, and skin rashes. Anaphylaxis might occur at any time during REMICADE infusion. Approximately 20% of REMICADE-treated patients in all clinical trials experienced an infusion reaction compared with 10% of placebo-treated patients [see Adverse Reactions (6.1)]. Prior to infusion with REMICADE, premedication may be administered at the physician's discretion. Premedication could include antihistamines (anti-H1 +/- anti-H2), acetaminophen and/or corticosteroids. The REMICADE infusion should begin within 3 hours of reconstitution and dilution. The infusion must be administered over a period of not less than 2 hours and must use an infusion set with an in-line, sterile, non-pyrogenic, low-protein-binding filter (pore size of 1.2 µm or less). The vials do not contain antibacterial preservatives. Therefore, any unused portion of the infusion solution should not be stored for reuse. REMICADE at doses >5 mg/kg should not be administered to patients with moderate to severe heart failure. In a randomized study evaluating REMICADE in patients with moderate to severe heart failure (New York Heart Association [NYHA] Functional Class III/IV), REMICADE treatment at 10 mg/kg was associated with an increased incidence of death and hospitalization due to worsening heart failure [see Warnings and Precautions (5.5) and Adverse Reactions (6.1)]. Opportunistic infections due to bacterial, mycobacterial, invasive fungal, viral, or parasitic organisms including aspergillosis, blastomycosis, candidiasis, coccidioidomycosis, cryptococcosis, histoplasmosis, legionellosis, listeriosis, pneumocystosis, salmonellosis and tuberculosis have been reported with TNF-blockers. Patients have frequently presented with disseminated rather than localized disease. Malignancies, some fatal, have been reported among children, adolescents and young adults who received treatment with TNF-blocking agents (initiation of therapy â‰¤18 years of age), including REMICADE. Approximately half of these cases were lymphomas, including Hodgkin's and non-Hodgkin's lymphoma. The other cases represented a variety of malignancies, including rare malignancies that are usually associated with immunosuppression and malignancies that are not usually observed in children and adolescents. The malignancies occurred after a median of 30 months (range 1 to 84 months) after the first dose of TNF blocker therapy. Most of the patients were receiving concomitant immunosuppressants. These cases were reported post-marketing and are derived from a variety of sources, including registries and spontaneous postmarketing reports. In the controlled portions of clinical trials of all the TNF-blocking agents, more cases of lymphoma have been observed among patients receiving a TNF blocker compared with control patients. In the controlled and open-label portions of REMICADE clinical trials, 5 patients developed lymphomas among 5707 patients treated with REMICADE (median duration of follow-up 1.0 years) vs. 0 lymphomas in 1600 control patients (median duration of follow-up 0.4 years). In rheumatoid arthritis patients, 2 lymphomas were observed for a rate of 0.08 cases per 100 patient-years of follow-up, which is approximately three-fold higher than expected in the general population. In the combined clinical trial population for rheumatoid arthritis, Crohn's disease, psoriatic arthritis, ankylosing spondylitis, ulcerative colitis, and plaque psoriasis, 5 lymphomas were observed for a rate of 0.10 cases per 100 patient-years of follow-up, which is approximately four-fold higher than expected in the general population. Patients with Crohn's disease, rheumatoid arthritis or plaque psoriasis, particularly patients with highly active disease and/or chronic exposure to immunosuppressant therapies, may be at a higher risk (up to several fold) than the general population for the development of lymphoma, even in the absence of TNF-blocking therapy. Cases of acute and chronic leukemia have been reported with postmarketing TNF-blocker use in rheumatoid arthritis and other indications. Even in the absence of TNF blocker therapy, patients with rheumatoid arthritis may be at a higher risk (approximately 2-fold) than the general population for the development of leukemia. Postmarketing cases of hepatosplenic T-cell lymphoma (HSTCL), a rare type of T-cell lymphoma, have been reported in patients treated with TNF blockers including REMICADE. These cases have had a very aggressive disease course and have been fatal. Almost all patients had received treatment with the immunosuppressants azathioprine or 6-mercaptopurine concomitantly with a TNF-blocker at or prior to diagnosis. The majority of reported REMICADE cases have occurred in patients with Crohn's disease or ulcerative colitis and most were in adolescent and young adult males. It is uncertain whether the occurrence of HSTCL is related to TNF-blockers or TNF-blockers in combination with these other immunosuppressants. When treating patients, consideration of whether to use REMICADE alone or in combination with other immunosuppressants such as azathioprine or 6-mercaptopurine should take into account a possibility that there is a higher risk of HSTCL with combination therapy versus an observed increased risk of immunogenicity and hypersensitivity reactions with REMICADE monotherapy from the clinical trial data [see Warnings and Precautions (5.7) and Adverse Reactions (6.1)]. Melanoma and Merkel cell carcinoma have been reported in patients treated with TNF blocker therapy, including REMICADE [see Adverse Reactions (6.2)]. Periodic skin examination is recommended for all patients, particularly those with risk factors for skin cancer. A population-based retrospective cohort study using data from Swedish national health registries found a 2 to 3 fold increase in the incidence of invasive cervical cancer in women with rheumatoid arthritis treated with infliximab compared to biologics-naïve patients or the general population, particularly those over 60 years of age. A causal relationship between infliximab and cervical cancer cannot be excluded. Periodic screening should continue in women treated with REMICADE [see Adverse Reactions (6.2)]. In the controlled portions of clinical trials of some TNF-blocking agents including REMICADE, more malignancies (excluding lymphoma and nonmelanoma skin cancer [NMSC]) have been observed in patients receiving those TNF-blockers compared with control patients. During the controlled portions of REMICADE trials in patients with moderately to severely active rheumatoid arthritis, Crohn's disease, psoriatic arthritis, ankylosing spondylitis, ulcerative colitis, and plaque psoriasis, 14 patients were diagnosed with malignancies (excluding lymphoma and NMSC) among 4019 REMICADE-treated patients vs. 1 among 1597 control patients (at a rate of 0.52/100 patient-years among REMICADE-treated patients vs. a rate of 0.11/100 patient-years among control patients), with median duration of follow-up 0.5 years for REMICADE-treated patients and 0.4 years for control patients. Of these, the most common malignancies were breast, colorectal, and melanoma. The rate of malignancies among REMICADE-treated patients was similar to that expected in the general population whereas the rate in control patients was lower than expected. In a clinical trial exploring the use of REMICADE in patients with moderate to severe chronic obstructive pulmonary disease (COPD), more malignancies, the majority of lung or head and neck origin, were reported in REMICADE-treated patients compared with control patients. All patients had a history of heavy smoking [see Adverse Reactions (6.1)]. Prescribers should exercise caution when considering the use of REMICADE in patients with moderate to severe COPD. Psoriasis patients should be monitored for nonmelanoma skin cancers (NMSCs), particularly those patients who have had prior prolonged phototherapy treatment. In the maintenance portion of clinical trials for REMICADE, NMSCs were more common in patients with previous phototherapy [see Adverse Reactions (6.1)]. The potential role of TNF-blocking therapy in the development of malignancies is not known [see Adverse Reactions (6.1)]. Rates in clinical trials for REMICADE cannot be compared to rates in clinical trials of other TNF-blockers and may not predict rates observed in a broader patient population. Caution should be exercised in considering REMICADE treatment in patients with a history of malignancy or in continuing treatment in patients who develop malignancy while receiving REMICADE. Use of TNF blockers, including REMICADE, has been associated with reactivation of hepatitis B virus (HBV) in patients who are chronic carriers of this virus. In some instances, HBV reactivation occurring in conjunction with TNF blocker therapy has been fatal. The majority of these reports have occurred in patients concomitantly receiving other medications that suppress the immune system, which may also contribute to HBV reactivation. Patients should be tested for HBV infection before initiating TNF blocker therapy, including REMICADE. For patients who test positive for hepatitis B surface antigen, consultation with a physician with expertise in the treatment of hepatitis B is recommended. Adequate data are not available on the safety or efficacy of treating patients who are carriers of HBV with anti-viral therapy in conjunction with TNF blocker therapy to prevent HBV reactivation. Patients who are carriers of HBV and require treatment with TNF blockers should be closely monitored for clinical and laboratory signs of active HBV infection throughout therapy and for several months following termination of therapy. In patients who develop HBV reactivation, TNF blockers should be stopped and antiviral therapy with appropriate supportive treatment should be initiated. The safety of resuming TNF blocker therapy after HBV reactivation is controlled is not known. Therefore, prescribers should exercise caution when considering resumption of TNF blocker therapy in this situation and monitor patients closely. Severe hepatic reactions, including acute liver failure, jaundice, hepatitis and cholestasis, have been reported in postmarketing data in patients receiving REMICADE. Autoimmune hepatitis has been diagnosed in some of these cases. Severe hepatic reactions occurred between 2 weeks to more than 1 year after initiation of REMICADE; elevations in hepatic aminotransferase levels were not noted prior to discovery of the liver injury in many of these cases. Some of these cases were fatal or necessitated liver transplantation. Patients with symptoms or signs of liver dysfunction should be evaluated for evidence of liver injury. If jaundice and/or marked liver enzyme elevations (e.g., â‰¥5 times the upper limit of normal) develop, REMICADE should be discontinued, and a thorough investigation of the abnormality should be undertaken. In clinical trials, mild or moderate elevations of ALT and AST have been observed in patients receiving REMICADE without progression to severe hepatic injury [see Adverse Reactions (6.1)]. REMICADE has been associated with adverse outcomes in patients with heart failure, and should be used in patients with heart failure only after consideration of other treatment options. The results of a randomized study evaluating the use of REMICADE in patients with heart failure (NYHA Functional Class III/IV) suggested higher mortality in patients who received 10 mg/kg REMICADE, and higher rates of cardiovascular adverse events at doses of 5 mg/kg and 10 mg/kg. There have been post-marketing reports of worsening heart failure, with and without identifiable precipitating factors, in patients taking REMICADE. There have also been post-marketing reports of new onset heart failure, including heart failure in patients without known pre-existing cardiovascular disease. Some of these patients have been under 50 years of age. If a decision is made to administer REMICADE to patients with heart failure, they should be closely monitored during therapy, and REMICADE should be discontinued if new or worsening symptoms of heart failure appear [see Contraindications (4) and Adverse Reactions (6.1)]. REMICADE should be discontinued for severe hypersensitivity reactions. Medications for the treatment of hypersensitivity reactions (e.g., acetaminophen, antihistamines, corticosteroids and/or epinephrine) should be available for immediate use in the event of a reaction [see Adverse Reactions (6.1)]. In rheumatoid arthritis, Crohn's disease and psoriasis clinical trials, re-administration of REMICADE after a period of no treatment resulted in a higher incidence of infusion reactions relative to regular maintenance treatment [see Adverse Reactions (6.1)]. In general, the benefit-risk of re-administration of REMICADE after a period of no-treatment, especially as a re-induction regimen given at weeks 0, 2 and 6, should be carefully considered. In the case where REMICADE maintenance therapy for psoriasis is interrupted, REMICADE should be reinitiated as a single dose followed by maintenance therapy. Serious cerebrovascular accidents, myocardial ischemia/infarction (some fatal), hypotension, hypertension, and arrhythmias have been reported during and within 24 hours of initiation of REMICADE infusion. Cases of transient visual loss have been reported during or within 2 hours of infusion of REMICADE. Monitor patients during infusion and if serious reaction occurs, discontinue infusion. Further management of reactions should be dictated by signs and symptoms [See Adverse Reactions (6)]. REMICADE and other agents that inhibit TNF have been associated with CNS manifestation of systemic vasculitis, seizure and new onset or exacerbation of clinical symptoms and/or radiographic evidence of central nervous system demyelinating disorders, including multiple sclerosis and optic neuritis, and peripheral demyelinating disorders, including Guillain-Barré syndrome. Prescribers should exercise caution in considering the use of REMICADE in patients with these neurologic disorders and should consider discontinuation of REMICADE if these disorders develop. Serious infections and neutropenia were seen in clinical studies with concurrent use of anakinra and another TNFÎ±-blocking agent, etanercept, with no added clinical benefit compared to etanercept alone. Because of the nature of the adverse reactions seen with the combination of etanercept and anakinra therapy, similar toxicities may also result from the combination of anakinra and other TNFÎ±-blocking agents. Therefore, the combination of REMICADE and anakinra is not recommended. In clinical studies, concurrent administration of TNF-blocking agents and abatacept have been associated with an increased risk of infections including serious infections compared with TNF-blocking agents alone, without increased clinical benefit. Therefore, the combination of REMICADE and abatacept is not recommended [see Drug Interactions (7.1)]. There is insufficient information regarding the concomitant use of REMICADE with other biological therapeutics used to treat the same conditions as REMICADE. The concomitant use of REMICADE with these biologics is not recommended because of the possibility of an increased risk of infection [see Drug Interactions (7.3)]. Treatment with REMICADE may result in the formation of autoantibodies and in the development of a lupus-like syndrome. If a patient develops symptoms suggestive of a lupus-like syndrome following treatment with REMICADE, treatment should be discontinued [see Adverse Reactions (6.1)]. The data described herein reflect exposure to REMICADE in 4779 adult patients (1304 patients with rheumatoid arthritis, 1106 patients with Crohn's disease, 202 with ankylosing spondylitis, 293 with psoriatic arthritis, 484 with ulcerative colitis, 1373 with plaque psoriasis, and 17 patients with other conditions), including 2625 patients exposed beyond 30 weeks and 374 exposed beyond 1 year. [For information on adverse reactions in pediatric patients see Adverse Reactions (6.1).] One of the most-common reasons for discontinuation of treatment was infusion-related reactions (e.g., dyspnea, flushing, headache and rash). Patients who became positive for antibodies to infliximab were more likely (approximately two-to three-fold) to have an infusion reaction than were those who were negative. Use of concomitant immunosuppressant agents appeared to reduce the frequency of both antibodies to infliximab and infusion reactions [see Adverse Reactions (6.1) and Drug Interactions (7.4)]. In REMICADE clinical studies, treated infections were reported in 36% of REMICADE-treated patients (average of 51 weeks of follow-up) and in 25% of placebo-treated patients (average of 37 weeks of follow-up). The infections most frequently reported were respiratory tract infections (including sinusitis, pharyngitis, and bronchitis) and urinary tract infections. Among REMICADE-treated patients, serious infections included pneumonia, cellulitis, abscess, skin ulceration, sepsis, and bacterial infection. In clinical trials, 7 opportunistic infections were reported; 2 cases each of coccidioidomycosis (1 case was fatal) and histoplasmosis (1 case was fatal), and 1 case each of pneumocystosis, nocardiosis and cytomegalovirus. Tuberculosis was reported in 14 patients, 4 of whom died due to miliary tuberculosis. Other cases of tuberculosis, including disseminated tuberculosis, also have been reported post-marketing. Most of these cases of tuberculosis occurred within the first 2 months after initiation of therapy with REMICADE and may reflect recrudescence of latent disease [see Warnings and Precautions (5.1)]. In the 1-year placebo-controlled studies RA I and RA II, 5.3% of patients receiving REMICADE every 8 weeks with MTX developed serious infections as compared to 3.4% of placebo patients receiving MTX. Of 924 patients receiving REMICADE, 1.7% developed pneumonia and 0.4% developed TB, when compared to 0.3% and 0.0% in the placebo arm respectively. In a shorter (22-week) placebo-controlled study of 1082 RA patients randomized to receive placebo, 3 mg/kg or 10 mg/kg REMICADE infusions at 0, 2, and 6 weeks, followed by every 8 weeks with MTX, serious infections were more frequent in the 10 mg/kg REMICADE group (5.3%) than the 3 mg/kg or placebo groups (1.7% in both). During the 54-week Crohn's II Study, 15% of patients with fistulizing Crohn's disease developed a new fistula-related abscess. In controlled trials, more REMICADE-treated patients developed malignancies than placebo-treated patients [see Warnings and Precautions (5.2)]. In a randomized controlled clinical trial exploring the use of REMICADE in patients with moderate to severe COPD who were either current smokers or ex-smokers, 157 patients were treated with REMICADE at doses similar to those used in rheumatoid arthritis and Crohn's disease. Of these REMICADE-treated patients, 9 developed a malignancy, including 1 lymphoma, for a rate of 7.67 cases per 100 patient-years of follow-up (median duration of follow-up 0.8 years; 95% CI 3.51 â€“ 14.56). There was 1 reported malignancy among 77 control patients for a rate of 1.63 cases per 100 patient-years of follow-up (median duration of follow-up 0.8 years; 95% CI 0.04 â€“ 9.10). The majority of the malignancies developed in the lung or head and neck. In a randomized study evaluating REMICADE in moderate to severe heart failure (NYHA Class III/IV; left ventricular ejection fraction â‰¤35%), 150 patients were randomized to receive treatment with 3 infusions of REMICADE 10 mg/kg, 5 mg/kg, or placebo, at 0, 2, and 6 weeks. Higher incidences of mortality and hospitalization due to worsening heart failure were observed in patients receiving the 10 mg/kg REMICADE dose. At 1 year, 8 patients in the 10 mg/kg REMICADE group had died compared with 4 deaths each in the 5 mg/kg REMICADE and the placebo groups. There were trends toward increased dyspnea, hypotension, angina, and dizziness in both the 10 mg/kg and 5 mg/kg REMICADE treatment groups, versus placebo. REMICADE has not been studied in patients with mild heart failure (NYHA Class I/II) [see Contraindications (4) and Warnings and Precautions (5.5)]. Treatment with REMICADE can be associated with the development of antibodies to infliximab. An enzyme immunoassay (EIA) method was originally used to measure anti-infliximab antibodies in clinical studies of REMICADE. The EIA method is subject to interference by serum infliximab, possibly resulting in an underestimation of the rate of patient antibody formation. A separate, drug-tolerant electrochemiluminescence immunoassay (ECLIA) method for detecting antibodies to infliximab was subsequently developed and validated. This method is 60-fold more sensitive than the original EIA. With the ECLIA method, all clinical samples can be classified as either positive or negative for antibodies to infliximab without the need for the inconclusive category. The incidence of antibodies to infliximab was based on the original EIA method in all clinical studies of REMICADE except for the Phase 3 study in pediatric patients with ulcerative colitis where the incidence of antibodies to infliximab was detected using both the EIA and ECLIA methods [see Adverse Reactions, Pediatric Ulcerative Colitis (6.1)]. The incidence of antibodies to infliximab in patients given a 3-dose induction regimen followed by maintenance dosing was approximately 10% as assessed through 1 to 2 years of REMICADE treatment. A higher incidence of antibodies to infliximab was observed in Crohn's disease patients receiving REMICADE after drug-free intervals >16 weeks. In a study of psoriatic arthritis in which 191 patients received 5 mg/kg with or without MTX, antibodies to infliximab occurred in 15% of patients. The majority of antibody-positive patients had low titers. Patients who were antibody-positive were more likely to have higher rates of clearance, reduced efficacy and to experience an infusion reaction [see Adverse Reactions (6.1)] than were patients who were antibody negative. Antibody development was lower among rheumatoid arthritis and Crohn's disease patients receiving immunosuppressant therapies such as 6-MP/AZA or MTX. In the psoriasis Study II, which included both the 5 mg/kg and 3 mg/kg doses, antibodies were observed in 36% of patients treated with 5 mg/kg every 8 weeks for 1 year, and in 51% of patients treated with 3 mg/kg every 8 weeks for 1 year. In the psoriasis Study III, which also included both the 5 mg/kg and 3 mg/kg doses, antibodies were observed in 20% of patients treated with 5 mg/kg induction (weeks 0, 2 and 6), and in 27% of patients treated with 3 mg/kg induction. Despite the increase in antibody formation, the infusion reaction rates in Studies I and II in patients treated with 5 mg/kg induction followed by every 8 week maintenance for 1 year and in Study III in patients treated with 5 mg/kg induction (14.1%â€“23.0%) and serious infusion reaction rates (<1%) were similar to those observed in other study populations. The clinical significance of apparent increased immunogenicity on efficacy and infusion reactions in psoriasis patients as compared to patients with other diseases treated with REMICADE over the long term is not known. Severe liver injury, including acute liver failure and autoimmune hepatitis, has been reported in patients receiving REMICADE [see Warnings and Precautions (5.4)]. Reactivation of hepatitis B virus has occurred in patients receiving TNF-blocking agents, including REMICADE, who are chronic carriers of this virus [see Warnings and Precautions (5.3)]. In clinical trials in rheumatoid arthritis, Crohn's disease, ulcerative colitis, ankylosing spondylitis, plaque psoriasis, and psoriatic arthritis, elevations of aminotransferases were observed (ALT more common than AST) in a greater proportion of patients receiving REMICADE than in controls (Table 1), both when REMICADE was given as monotherapy and when it was used in combination with other immunosuppressive agents. In general, patients who developed ALT and AST elevations were asymptomatic, and the abnormalities decreased or resolved with either continuation or discontinuation of REMICADE, or modification of concomitant medications. • Placebo patients received methotrexate while REMICADE patients received both REMICADE and methotrexate. Median follow-up was 58 weeks. • Placebo patients in the 2 Phase 3 trials in Crohn's disease received an initial dose of 5 mg/kg REMICADE at study start and were on placebo in the maintenance phase. Patients who were randomized to the placebo maintenance group and then later crossed over to REMICADE are included in the REMICADE group in ALT analysis. Median follow-up was 54 weeks. • Median follow-up was 30 weeks. Specifically, the median duration of follow-up was 30 weeks for placebo and 31 weeks for REMICADE. • Median follow-up was 24 weeks for the placebo group and 102 weeks for the REMICADE group. • Median follow-up was 39 weeks for the REMICADE group and 18 weeks for the placebo group. • ALT values are obtained in 2 Phase 3 psoriasis studies with median follow-up of 50 weeks for REMICADE and 16 weeks for placebo. Safety data are available from 4779 REMICADE-treated adult patients, including 1304 with rheumatoid arthritis, 1106 with Crohn's disease, 484 with ulcerative colitis, 202 with ankylosing spondylitis, 293 with psoriatic arthritis, 1373 with plaque psoriasis and 17 with other conditions. [For information on other adverse reactions in pediatric patients, see Adverse Reactions (6.1)]. Adverse reactions reported in â‰¥5% of all patients with rheumatoid arthritis receiving 4 or more infusions are in Table 2. The types and frequencies of adverse reactions observed were similar in REMICADE-treated rheumatoid arthritis, ankylosing spondylitis, psoriatic arthritis, plaque psoriasis and Crohn's disease patients except for abdominal pain, which occurred in 26% of REMICADE-treated patients with Crohn's disease. In the Crohn's disease studies, there were insufficient numbers and duration of follow-up for patients who never received REMICADE to provide meaningful comparisons. There were some differences in the adverse reactions observed in the pediatric patients receiving REMICADE compared to those observed in adults with Crohn's disease. These differences are discussed in the following paragraphs. The following adverse reactions were reported more commonly in 103 randomized pediatric Crohn's disease patients administered 5 mg/kg REMICADE through 54 weeks than in 385 adult Crohn's disease patients receiving a similar treatment regimen: anemia (11%), leukopenia (9%), flushing (9%), viral infection (8%), neutropenia (7%), bone fracture (7%), bacterial infection (6%), and respiratory tract allergic reaction (6%). In Study Peds Crohn's, 18% of randomized patients experienced 1 or more infusion reactions, with no notable difference between treatment groups. Of the 112 patients in Study Peds Crohn's, there were no serious infusion reactions, and 2 patients had non-serious anaphylactoid reactions. In Study Peds Crohn's, in which all patients received stable doses of 6-MP, AZA, or MTX, excluding inconclusive samples, 3 of 24 patients had antibodies to infliximab. Although 105 patients were tested for antibodies to infliximab, 81 patients were classified as inconclusive because they could not be ruled as negative due to assay interference by the presence of infliximab in the sample. Infections were reported in 31 (52%) of 60 treated patients in the pediatric UC trial and 22 (37%) required oral or parenteral antimicrobial treatment. The proportion of patients with infections in the pediatric UC trial was similar to that in the pediatric Crohn's disease study (Study Peds Crohn's) but higher than the proportion in the adults' ulcerative colitis studies (Study UC I and Study UC II). The overall incidence of infections in the pediatric UC trial was 13/22 (59%) in the every 8 week maintenance treatment group. Upper respiratory tract infection (7/60 [12%]) and pharyngitis (5/60 [8%]) were the most frequently reported respiratory system infections. Serious infections were reported in 12% (7/60) of all treated patients. In the pediatric UC trial, 58 patients were evaluated for antibodies to infliximab using the EIA as well as the drug-tolerant ECLIA. With the EIA, 4 of 58 (7%) patients had antibodies to infliximab. With the ECLIA, 30 of 58 (52%) patients had antibodies to infliximab [see Adverse Reactions, Immunogenicity (6.1)]. The higher incidence of antibodies to infliximab by the ECLIA method was due to the 60-fold higher sensitivity compared to the EIA method. While EIA-positive patients generally had undetectable trough infliximab concentrations, ECLIA-positive patients could have detectable trough concentrations of infliximab because the ECLIA assay is more sensitive and drug-tolerant. Elevations of ALT up to 3 times the upper limit of normal (ULN) were seen in 17% (10/60) of pediatric patients in the pediatric UC trial; 7% (4/60) had ALT elevations â‰¥3 × ULN, and 2% (1/60) had elevations â‰¥5 × ULN (median follow-up was 49 weeks). The following adverse reactions, some with fatal outcome, have been reported during post-approval use of REMICADE: neutropenia [see Warnings and Precautions (5.6)], agranulocytosis (including infants exposed in utero to infliximab), interstitial lung disease (including pulmonary fibrosis/interstitial pneumonitis and rapidly progressive disease), idiopathic thrombocytopenic purpura, thrombotic thrombocytopenic purpura, pericardial effusion, systemic and cutaneous vasculitis, erythema multiforme, Stevens-Johnson Syndrome, toxic epidermal necrolysis, peripheral demyelinating disorders (such as Guillain-Barré syndrome, chronic inflammatory demyelinating polyneuropathy, and multifocal motor neuropathy), new onset and worsening psoriasis (all subtypes including pustular, primarily palmoplantar), transverse myelitis, and neuropathies (additional neurologic reactions have also been observed) [see Warnings and Precautions (5.9)], acute liver failure, jaundice, hepatitis, and cholestasis [see Warnings and Precautions (5.4)], serious infections [see Warnings and Precautions (5.1)], malignancies, including leukemia, melanoma, Merkel cell carcinoma, and cervical cancer [see Warnings and Precautions (5.2)] and vaccine breakthrough infection including bovine tuberculosis (disseminated BCG infection) following vaccination in an infant exposed in utero to infliximab [see Warnings and Precautions (5.15)]. In post-marketing experience, cases of anaphylactic reactions, including anaphylactic shock, laryngeal/pharyngeal edema and severe bronchospasm, and seizure have been associated with REMICADE administration. Cases of transient visual loss have been reported in association with REMICADE during or within 2 hours of infusion. Cerebrovascular accidents, myocardial ischemia/infarction (some fatal), and arrhythmia occurring within 24 hours of initiation of infusion have also been reported [see Warnings and Precautions (5.8)]. Serious adverse reactions in the post-marketing experience with REMICADE in the pediatric population have also included malignancies, including hepatosplenic T-cell lymphomas [see Boxed Warning and Warnings and Precautions (5.2)], transient hepatic enzyme abnormalities, lupus-like syndromes, and the development of autoantibodies. An increased risk of serious infections was seen in clinical studies of other TNFÎ±-blocking agents used in combination with anakinra or abatacept, with no added clinical benefit. Because of the nature of the adverse reactions seen with these combinations with TNF-blocker therapy, similar toxicities may also result from the combination of anakinra or abatacept with other TNFÎ±-blocking agents. Therefore, the combination of REMICADE and anakinra or abatacept is not recommended [see Warnings and Precautions (5.10 and 5.11)]. The combination of REMICADE with other biological therapeutics used to treat the same conditions as REMICADE is not recommended [see Warnings and Precautions (5.12)]. Specific drug interaction studies, including interactions with MTX, have not been conducted. The majority of patients in rheumatoid arthritis or Crohn's disease clinical studies received one or more concomitant medications. In rheumatoid arthritis, concomitant medications besides MTX were nonsteroidal anti-inflammatory agents (NSAIDs), folic acid, corticosteroids and/or narcotics. Concomitant Crohn's disease medications were antibiotics, antivirals, corticosteroids, 6-MP/AZA and aminosalicylates. In psoriatic arthritis clinical trials, concomitant medications included MTX in approximately half of the patients as well as NSAIDs, folic acid and corticosteroids. Concomitant MTX use may decrease the incidence of anti-infliximab antibody production and increase infliximab concentrations. The formation of CYP450 enzymes may be suppressed by increased levels of cytokines (e.g., TNFÎ±, IL-1, IL-6, IL-10, IFN) during chronic inflammation. Therefore, it is expected that for a molecule that antagonizes cytokine activity, such as infliximab, the formation of CYP450 enzymes could be normalized. Upon initiation or discontinuation of REMICADE in patients being treated with CYP450 substrates with a narrow therapeutic index, monitoring of the effect (e.g., warfarin) or drug concentration (e.g., cyclosporine or theophylline) is recommended and the individual dose of the drug product may be adjusted as needed. It is recommended that live vaccines not be given concurrently with REMICADE. It is also recommended that live vaccines not be given to infants after in utero exposure to infliximab for at least 6 months following birth [see Warnings and Precautions (5.15)]. It is recommended that therapeutic infectious agents not be given concurrently with REMICADE [see Warnings and Precautions (5.15)]. Pregnancy Category B. It is not known whether REMICADE can cause fetal harm when administered to a pregnant woman or can affect reproduction capacity. REMICADE should be given to a pregnant woman only if clearly needed. Because infliximab does not cross-react with TNFÎ± in species other than humans and chimpanzees, animal reproduction studies have not been conducted with REMICADE. No evidence of maternal toxicity, embryotoxicity or teratogenicity was observed in a developmental toxicity study conducted in mice using an analogous antibody that selectively inhibits the functional activity of mouse TNFÎ±. Doses of 10 to 15 mg/kg in pharmacodynamic animal models with the anti-TNF analogous antibody produced maximal pharmacologic effectiveness. Doses up to 40 mg/kg were shown to produce no adverse effects in animal reproduction studies. As with other IgG antibodies, infliximab crosses the placenta. Infliximab has been detected in the serum of infants up to 6 months following birth. Consequently, these infants may be at increased risk of infection, including disseminated infection which can become fatal. At least a six month waiting period following birth is recommended before the administration of live vaccines (e.g., BCG vaccine or other live vaccines, such as the rotavirus vaccine) to these infants [see Warnings and Precautions (5.15)]. Cases of agranulocytosis in infants exposed in utero have also been reported [see Adverse Reactions (6.2)]. The safety and effectiveness of REMICADE have been established in pediatric patients 6 to 17 years of age for induction and maintenance treatment of Crohn's disease or ulcerative colitis. However, REMICADE has not been studied in children with Crohn's disease or ulcerative colitis <6 years of age. 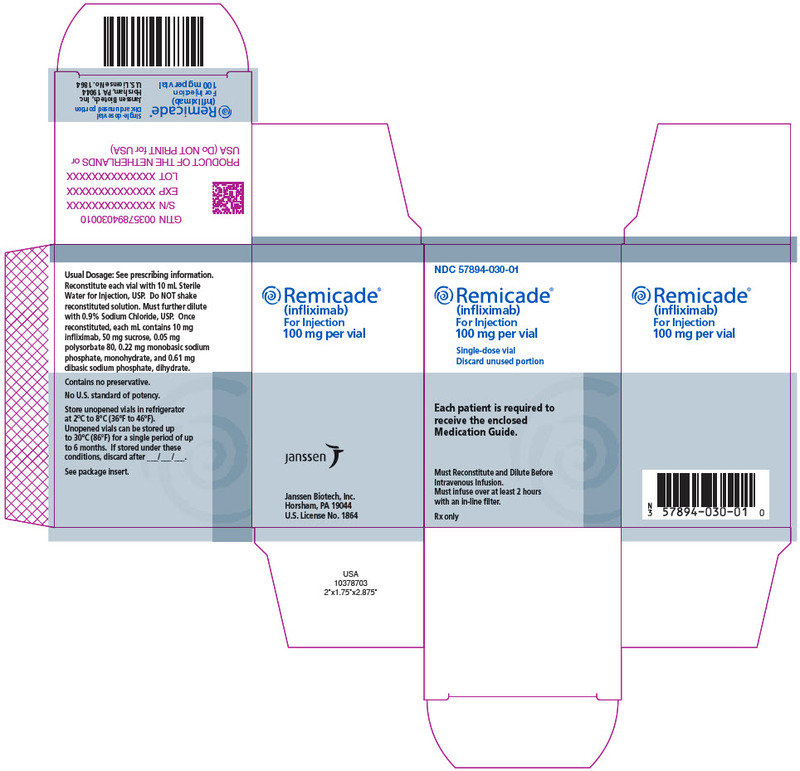 REMICADE is indicated for reducing signs and symptoms and inducing and maintaining clinical remission in pediatric patients with moderately to severely active Crohn's disease who have had an inadequate response to conventional therapy [see Boxed Warning, Warnings and Precautions (5), Indications and Usage (1.2), Dosage and Administration (2.2), Clinical Studies (14.2) and Adverse Reactions (6.1)]. REMICADE has been studied only in combination with conventional immunosuppressive therapy in pediatric Crohn's disease. The longer term (greater than 1 year) safety and effectiveness of REMICADE in pediatric Crohn's disease patients have not been established in clinical trials. The safety and effectiveness of REMICADE for reducing signs and symptoms and inducing and maintaining clinical remission in pediatric patients aged 6 years and older with moderately to severely active ulcerative colitis who have had an inadequate response to conventional therapy are supported by evidence from adequate and well-controlled studies of REMICADE in adults. Additional safety and pharmacokinetic data were collected in 60 pediatric patients aged 6 years and older [see Clinical Pharmacology (12.3), Dosage and Administration (2.4), Adverse Reactions (6.1), and Clinical Studies (14.4)]. The effectiveness of REMICADE in inducing and maintaining mucosal healing could not be established. Although 41 patients had a Mayo endoscopy subscore of 0 or 1 at the Week 8 endoscopy, the induction phase was open-label and lacked a control group. Only 9 patients had an optional endoscopy at Week 54. The safety and efficacy of REMICADE in patients with juvenile rheumatoid arthritis (JRA) were evaluated in a multicenter, randomized, placebo-controlled, double-blind study for 14 weeks, followed by a double-blind, all-active treatment extension, for a maximum of 44 weeks. Patients with active JRA between the ages of 4 and 17 years who had been treated with MTX for at least 3 months were enrolled. Concurrent use of folic acid, oral corticosteroids (â‰¤0.2 mg/kg/day of prednisone or equivalent), NSAIDs, and/or disease modifying antirheumatic drugs (DMARDs) was permitted. The study failed to establish the efficacy of REMICADE in the treatment of JRA. Key observations in the study included a high placebo response rate and a higher rate of immunogenicity than what has been observed in adults. Additionally, a higher rate of clearance of infliximab was observed than had been observed in adults [see Clinical Pharmacology (12.3)]. In rheumatoid arthritis and plaque psoriasis clinical trials, no overall differences were observed in effectiveness or safety in 181 patients with rheumatoid arthritis and 75 patients with plaque psoriasis, aged 65 or older who received REMICADE, compared to younger patients-although the incidence of serious adverse reactions in patients aged 65 or older was higher in both REMICADE and control groups compared to younger patients. In Crohn's disease, ulcerative colitis, ankylosing spondylitis and psoriatic arthritis studies, there were insufficient numbers of patients aged 65 and over to determine whether they respond differently from patients aged 18 to 65. There is a greater incidence of infections in the elderly population in general. The incidence of serious infections in REMICADE-treated patients 65 years and older was greater than in those under 65 years of age; therefore caution should be used in treating the elderly [see Adverse Reactions (6.1)]. Infliximab, the active ingredient in REMICADE, is a chimeric IgG1Îº monoclonal antibody (composed of human constant and murine variable regions) specific for human tumor necrosis factor-alpha (TNFÎ±). It has a molecular weight of approximately 149.1 kilodaltons. Infliximab is produced by a recombinant cell line cultured by continuous perfusion and is purified by a series of steps that includes measures to inactivate and remove viruses. Infliximab neutralizes the biological activity of TNFÎ± by binding with high affinity to the soluble and transmembrane forms of TNFÎ± and inhibits binding of TNFÎ± with its receptors. Infliximab does not neutralize TNFÎ² (lymphotoxin-Î±), a related cytokine that utilizes the same receptors as TNFÎ±. Biological activities attributed to TNFÎ± include: induction of pro-inflammatory cytokines such as interleukins (IL) 1 and 6, enhancement of leukocyte migration by increasing endothelial layer permeability and expression of adhesion molecules by endothelial cells and leukocytes, activation of neutrophil and eosinophil functional activity, induction of acute phase reactants and other liver proteins, as well as tissue degrading enzymes produced by synoviocytes and/or chondrocytes. Cells expressing transmembrane TNFÎ± bound by infliximab can be lysed in vitro or in vivo. Infliximab inhibits the functional activity of TNFÎ± in a wide variety of in vitro bioassays utilizing human fibroblasts, endothelial cells, neutrophils, B and T-lymphocytes and epithelial cells. The relationship of these biological response markers to the mechanism(s) by which REMICADE exerts its clinical effects is unknown. Anti-TNFÎ± antibodies reduce disease activity in the cotton-top tamarin colitis model, and decrease synovitis and joint erosions in a murine model of collagen-induced arthritis. Infliximab prevents disease in transgenic mice that develop polyarthritis as a result of constitutive expression of human TNFÎ±, and when administered after disease onset, allows eroded joints to heal. Elevated concentrations of TNFÎ± have been found in involved tissues and fluids of patients with rheumatoid arthritis, Crohn's disease, ulcerative colitis, ankylosing spondylitis, psoriatic arthritis and plaque psoriasis. In rheumatoid arthritis, treatment with REMICADE reduced infiltration of inflammatory cells into inflamed areas of the joint as well as expression of molecules mediating cellular adhesion [E-selectin, intercellular adhesion molecule-1 (ICAM-1) and vascular cell adhesion molecule-1 (VCAM-1)], chemoattraction [IL-8 and monocyte chemotactic protein (MCP-1)] and tissue degradation [matrix metalloproteinase (MMP) 1 and 3]. In Crohn's disease, treatment with REMICADE reduced infiltration of inflammatory cells and TNFÎ± production in inflamed areas of the intestine, and reduced the proportion of mononuclear cells from the lamina propria able to express TNFÎ± and interferon. After treatment with REMICADE, patients with rheumatoid arthritis or Crohn's disease exhibited decreased levels of serum IL-6 and C-reactive protein (CRP) compared to baseline. Peripheral blood lymphocytes from REMICADE-treated patients showed no significant decrease in number or in proliferative responses to in vitro mitogenic stimulation when compared to cells from untreated patients. In psoriatic arthritis, treatment with REMICADE resulted in a reduction in the number of T-cells and blood vessels in the synovium and psoriatic skin lesions as well as a reduction of macrophages in the synovium. In plaque psoriasis, REMICADE treatment may reduce the epidermal thickness and infiltration of inflammatory cells. The relationship between these pharmacodynamic activities and the mechanism(s) by which REMICADE exerts its clinical effects is unknown. In adults, single intravenous (IV) infusions of 3 mg/kg to 20 mg/kg showed a linear relationship between the dose administered and the maximum serum concentration. The volume of distribution at steady state was independent of dose and indicated that infliximab was distributed primarily within the vascular compartment. Pharmacokinetic results for single doses of 3 mg/kg to 10 mg/kg in rheumatoid arthritis, 5 mg/kg in Crohn's disease, and 3 mg/kg to 5 mg/kg in plaque psoriasis indicate that the median terminal half-life of infliximab is 7.7 to 9.5 days. Following an initial dose of REMICADE, repeated infusions at 2 and 6 weeks resulted in predictable concentration-time profiles following each treatment. No systemic accumulation of infliximab occurred upon continued repeated treatment with 3 mg/kg or 10 mg/kg at 4- or 8-week intervals. Development of antibodies to infliximab increased infliximab clearance. At 8 weeks after a maintenance dose of 3 to 10 mg/kg of REMICADE, median infliximab serum concentrations ranged from approximately 0.5 to 6 mcg/mL; however, infliximab concentrations were not detectable (<0.1 mcg/mL) in patients who became positive for antibodies to infliximab. No major differences in clearance or volume of distribution were observed in patient subgroups defined by age, weight, or gender. It is not known if there are differences in clearance or volume of distribution in patients with marked impairment of hepatic or renal function. Infliximab pharmacokinetic characteristics (including peak and trough concentrations and terminal half-life) were similar in pediatric (aged 6 to 17 years) and adult patients with Crohn's disease or ulcerative colitis following the administration of 5 mg/kg infliximab. The significance of the results of nonclinical studies for human risk is unknown. A repeat dose toxicity study was conducted with mice given cV1q anti-mouse TNFÎ± to evaluate tumorigenicity. CV1q is an analogous antibody that inhibits the function of TNFÎ± in mice. Animals were assigned to 1 of 3 dose groups: control, 10 mg/kg or 40 mg/kg cV1q given weekly for 6 months. The weekly doses of 10 mg/kg and 40 mg/kg are 2 and 8 times, respectively, the human dose of 5 mg/kg for Crohn's disease. Results indicated that cV1q did not cause tumorigenicity in mice. No clastogenic or mutagenic effects of infliximab were observed in the in vivo mouse micronucleus test or the Salmonella-Escherichia coli (Ames) assay, respectively. Chromosomal aberrations were not observed in an assay performed using human lymphocytes. It is not known whether infliximab can impair fertility in humans. No impairment of fertility was observed in a fertility and general reproduction toxicity study with the analogous mouse antibody used in the 6-month chronic toxicity study. The safety and efficacy of single and multiple doses of REMICADE were assessed in 2 randomized, double-blind, placebo-controlled clinical studies in 653 patients with moderate to severely active Crohn's disease [Crohn's Disease Activity Index (CDAI) â‰¥220 and â‰¤400] with an inadequate response to prior conventional therapies. Concomitant stable doses of aminosalicylates, corticosteroids and/or immunomodulatory agents were permitted and 92% of patients continued to receive at least one of these medications. In the single-dose trial of 108 patients, 16% (4/25) of placebo patients achieved a clinical response (decrease in CDAI â‰¥70 points) at Week 4 vs. 81% (22/27) of patients receiving 5 mg/kg REMICADE (p<0.001, two-sided, Fisher's Exact test). Additionally, 4% (1/25) of placebo patients and 48% (13/27) of patients receiving 5 mg/kg REMICADE achieved clinical remission (CDAI<150) at Week 4. In a multidose trial (ACCENT I [Study Crohn's I]), 545 patients received 5 mg/kg at Week 0 and were then randomized to one of three treatment groups; the placebo maintenance group received placebo at Weeks 2 and 6, and then every 8 weeks; the 5 mg/kg maintenance group received 5 mg/kg at Weeks 2 and 6, and then every 8 weeks; and the 10 mg/kg maintenance group received 5 mg/kg at Weeks 2 and 6, and then 10 mg/kg every 8 weeks. Patients in response at Week 2 were randomized and analyzed separately from those not in response at Week 2. Corticosteroid taper was permitted after Week 6. Patients who achieved a response and subsequently lost response were eligible to receive REMICADE on an episodic basis at a dose that was 5 mg/kg higher than the dose to which they were randomized. The majority of such patients responded to the higher dose. 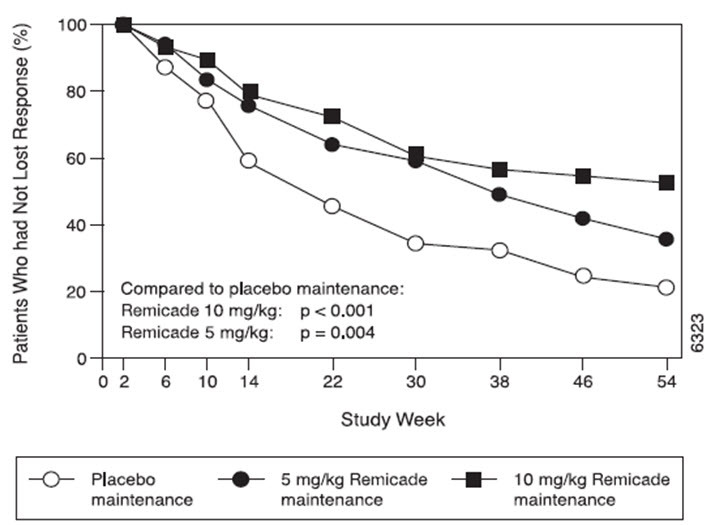 Among patients who were not in response at Week 2, 59% (92/157) of REMICADE maintenance patients responded by Week 14 compared to 51% (39/77) of placebo maintenance patients. Among patients who did not respond by Week 14, additional therapy did not result in significantly more responses [see Dosage and Administration (2)]. The safety and efficacy of REMICADE were assessed in 2 randomized, double-blind, placebo-controlled studies in patients with fistulizing Crohn's disease with fistula(s) that were of at least 3 months duration. Concurrent use of stable doses of corticosteroids, 5-aminosalicylates, antibiotics, MTX, 6-mercaptopurine (6-MP) and/or azathioprine (AZA) was permitted. In the first trial, 94 patients received 3 doses of either placebo or REMICADE at Weeks 0, 2 and 6. Fistula response (â‰¥50% reduction in number of enterocutaneous fistulas draining upon gentle compression on at least 2 consecutive visits without an increase in medication or surgery for Crohn's disease) was seen in 68% (21/31) of patients in the 5 mg/kg REMICADE group (P=0.002) and 56% (18/32) of patients in the 10 mg/kg REMICADE group (P=0.021) vs. 26% (8/31) of patients in the placebo arm. The median time to onset of response and median duration of response in REMICADE-treated patients was 2 and 12 weeks, respectively. Closure of all fistulas was achieved in 52% of REMICADE-treated patients compared with 13% of placebo-treated patients (P<0.001). In the second trial (ACCENT II [Study Crohn's II]), patients who were enrolled had to have at least 1 draining enterocutaneous (perianal, abdominal) fistula. All patients received 5 mg/kg REMICADE at Weeks 0, 2 and 6. 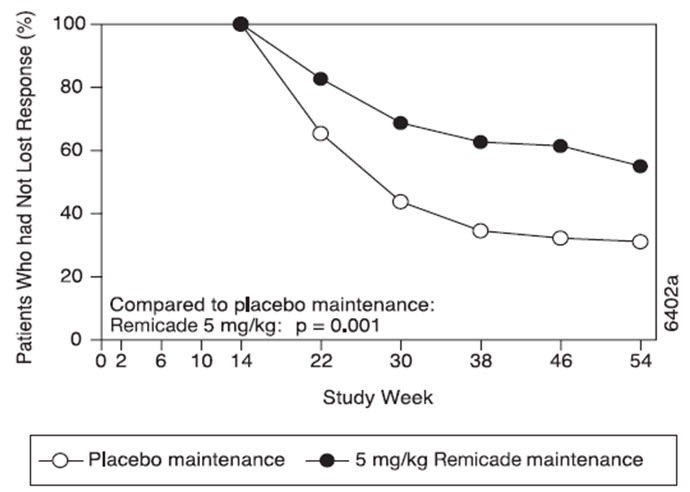 Patients were randomized to placebo or 5 mg/kg REMICADE maintenance at Week 14. Patients received maintenance doses at Week 14 and then every 8 weeks through Week 46. Patients who were in fistula response (fistula response was defined the same as in the first trial) at both Weeks 10 and 14 were randomized separately from those not in response. The primary endpoint was time from randomization to loss of response among those patients who were in fistula response. The safety and efficacy of REMICADE were assessed in a randomized, open-label study (Study Peds Crohn's) in 112 pediatric patients aged 6 to 17 years old with moderately to severely active Crohn's disease and an inadequate response to conventional therapies. The median age was 13 years and the median Pediatric Crohn's Disease Activity Index (PCDAI) was 40 (on a scale of 0 to 100). All patients were required to be on a stable dose of 6-MP, AZA, or MTX; 35% were also receiving corticosteroids at baseline. At Week 10, 88% of patients were in clinical response (defined as a decrease from baseline in the PCDAI score of â‰¥15 points and total PCDAI score of â‰¤30 points), and 59% were in clinical remission (defined as PCDAI score of â‰¤10 points). • Defined as a decrease from baseline in the PCDAI score of â‰¥15 points and total score of â‰¤30 points. • Defined as a PCDAI score of â‰¤10 points. The safety and efficacy of REMICADE were assessed in 2 randomized, double-blind, placebo-controlled clinical studies in 728 patients with moderately to severely active ulcerative colitis (UC) (Mayo score5 6 to 12 [of possible range 0 to 12], Endoscopy subscore â‰¥2) with an inadequate response to conventional oral therapies (Studies UC I and UC II). Concomitant treatment with stable doses of aminosalicylates, corticosteroids and/or immunomodulatory agents was permitted. Corticosteroid taper was permitted after Week 8. Patients were randomized at week 0 to receive either placebo, 5 mg/kg REMICADE or 10 mg/kg REMICADE at Weeks 0, 2, 6, and every 8 weeks thereafter through Week 46 in Study UC I, and at Weeks 0, 2, 6, and every 8 weeks thereafter through Week 22 in Study UC II. In Study UC II, patients were allowed to continue blinded therapy to Week 46 at the investigator's discretion. Patients in Study UC I had failed to respond or were intolerant to oral corticosteroids, 6-MP, or AZA. Patients in Study UC II had failed to respond or were intolerant to the above treatments and/or aminosalicylates. Similar proportions of patients in Studies UC I and UC II were receiving corticosteroids (61% and 51%, respectively), 6-MP/AZA (49% and 43%) and aminosalicylates (70% and 75%) at baseline. More patients in Study UC II than UC I were taking solely aminosalicylates for UC (26% vs. 11%, respectively). Clinical response was defined as a decrease from baseline in the Mayo score by â‰¥30% and â‰¥3 points, accompanied by a decrease in the rectal bleeding subscore of â‰¥1 or a rectal bleeding subscore of 0 or 1. • Patients who had a prohibited change in medication, had an ostomy or colectomy, or discontinued study infusions due to lack of efficacy are considered to not be in clinical response, clinical remission or mucosal healing from the time of the event onward. • Defined as a Mayo score â‰¤2 points, no individual subscore >1. • Defined as a 0 or 1 on the endoscopy subscore of the Mayo score. The safety and effectiveness of REMICADE for reducing signs and symptoms and inducing and maintaining clinical remission in pediatric patients aged 6 years and older with moderately to severely active ulcerative colitis who have had an inadequate response to conventional therapy are supported by evidence from adequate and well-controlled studies of REMICADE in adults. Additional safety and pharmacokinetic data were collected in an open-label pediatric UC trial in 60 pediatric patients aged 6 through 17 years (median age 14.5 years) with moderately to severely active ulcerative colitis (Mayo score of 6 to 12; Endoscopic subscore â‰¥2) and an inadequate response to conventional therapies. At baseline, the median Mayo score was 8, 53% of patients were receiving immunomodulator therapy (6-MP/AZA/MTX), and 62% of patients were receiving corticosteroids (median dose 0.5 mg/kg/day in prednisone equivalents). Discontinuation of immunomodulators and corticosteroid taper were permitted after Week 0. Clinical response at Week 8 was defined as a decrease from baseline in the Mayo score by â‰¥30% and â‰¥3 points, including a decrease in the rectal bleeding subscore by â‰¥1 points or achievement of a rectal bleeding subscore of 0 or 1. Clinical remission at Week 8 was measured by the Mayo score, defined as a Mayo score of â‰¤2 points with no individual subscore >1. Clinical remission was also assessed at Week 8 and Week 54 using the Pediatric Ulcerative Colitis Activity Index (PUCAI)6 score and was defined by a PUCAI score of <10 points. The safety and efficacy of REMICADE were assessed in 2 multicenter, randomized, double-blind, pivotal trials: ATTRACT (Study RA I) and ASPIRE (Study RA II). Concurrent use of stable doses of folic acid, oral corticosteroids (â‰¤10 mg/day) and/or non-steroidal anti-inflammatory drugs (NSAIDs) was permitted. Study RA II was a placebo-controlled study of 3 active treatment arms in 1004 MTX naive patients of 3 or fewer years' duration active rheumatoid arthritis. Patients enrolled had a median age of 51 years with a median disease duration of 0.6 years, median swollen and tender joint count of 19 and 31, respectively, and >80% of patients had baseline joint erosions. At randomization, all patients received MTX (optimized to 20 mg/wk by Week 8) and either placebo, 3 mg/kg or 6 mg/kg REMICADE at Weeks 0, 2, and 6 and every 8 weeks thereafter. Data on use of REMICADE without concurrent MTX are limited [see Adverse Reactions (6.1)]. In Study RA II, after 54 weeks of treatment, both doses of REMICADE + MTX resulted in statistically significantly greater response in signs and symptoms compared to MTX alone as measured by the proportion of patients achieving ACR 20, 50 and 70 responses (Table 7). More patients treated with REMICADE reached a major clinical response than placebo-treated patients (Table 7). • A major clinical response was defined as a 70% ACR response for 6 consecutive months (consecutive visits spanning at least 26 weeks) through Week 102 for Study RA I and Week 54 for Study RA II. In Study RA II, >90% of patients had at least 2 evaluable X-rays. Inhibition of progression of structural damage was observed at Weeks 30 and 54 (Table 9) in the REMICADE + MTX groups compared to MTX alone. Patients treated with REMICADE + MTX demonstrated less progression of structural damage compared to MTX alone, whether baseline acute-phase reactants (ESR and CRP) were normal or elevated: patients with elevated baseline acute-phase reactants treated with MTX alone demonstrated a mean progression in vdH-S score of 4.2 units compared to patients treated with REMICADE + MTX who demonstrated 0.5 units of progression; patients with normal baseline acute phase reactants treated with MTX alone demonstrated a mean progression in vdH-S score of 1.8 units compared to REMICADE + MTX who demonstrated 0.2 units of progression. Of patients receiving REMICADE + MTX, 59% had no progression (vdH-S score â‰¤0 unit) of structural damage compared to 45% of patients receiving MTX alone. In a subset of patients who began the study without erosions, REMICADE + MTX maintained an erosion-free state at 1 year in a greater proportion of patients than MTX alone, 79% (77/98) vs. 58% (23/40), respectively (P<0.01). Fewer patients in the REMICADE + MTX groups (47%) developed erosions in uninvolved joints compared to MTX alone (59%). • P<0.001 for each outcome against placebo. In Study RA II, both REMICADE treatment groups showed greater improvement in HAQ-DI from baseline averaged over time through Week 54 compared to MTX alone; 0.7 for REMICADE + MTX vs. 0.6 for MTX alone (Pâ‰¤0.001). No worsening in the SF-36 mental component summary score was observed. The safety and efficacy of REMICADE were assessed in a randomized, multicenter, double-blind, placebo-controlled study in 279 patients with active ankylosing spondylitis. Patients were between 18 and 74 years of age, and had ankylosing spondylitis as defined by the modified New York criteria for Ankylosing Spondylitis.4 Patients were to have had active disease as evidenced by both a Bath Ankylosing Spondylitis Disease Activity Index (BASDAI) score >4 (possible range 0â€“10) and spinal pain >4 (on a Visual Analog Scale [VAS] of 0â€“10). Patients with complete ankylosis of the spine were excluded from study participation, and the use of Disease Modifying Anti-Rheumatic Drugs (DMARDs) and systemic corticosteroids were prohibited. Doses of REMICADE 5 mg/kg or placebo were administered intravenously at Weeks 0, 2, 6, 12 and 18. At 24 weeks, the proportions of patients achieving a 50% and a 70% improvement in the signs and symptoms of ankylosing spondylitis, as measured by ASAS response criteria (ASAS 50 and ASAS 70, respectively), were 44% and 28%, respectively, for patients receiving REMICADE, compared to 9% and 4%, respectively, for patients receiving placebo (P<0.001, REMICADE vs. placebo). A low level of disease activity (defined as a value <20 [on a scale of 0â€“100 mm] in each of the 4 ASAS response parameters) was achieved in 22% of REMICADE-treated patients vs. 1% in placebo-treated patients (P<0.001). • Measured on a VAS with 0="none" and 10="severe"
The median improvement from baseline in the general health-related quality-of-life questionnaire SF-36 physical component summary score at Week 24 was 10.2 for the REMICADE group vs. 0.8 for the placebo group (P<0.001). There was no change in the SF-36 mental component summary score in either the REMICADE group or the placebo group. Safety and efficacy of REMICADE were assessed in a multicenter, double-blind, placebo-controlled study in 200 adult patients with active psoriatic arthritis despite DMARD or NSAID therapy (â‰¥5 swollen joints and â‰¥5 tender joints) with 1 or more of the following subtypes: arthritis involving DIP joints (n=49), arthritis mutilans (n=3), asymmetric peripheral arthritis (n=40), polyarticular arthritis (n=100), and spondylitis with peripheral arthritis (n=8). Patients also had plaque psoriasis with a qualifying target lesion â‰¥2 cm in diameter. Forty-six percent of patients continued on stable doses of methotrexate (â‰¤25 mg/week). During the 24-week double-blind phase, patients received either 5 mg/kg REMICADE or placebo at Weeks 0, 2, 6, 14, and 22 (100 patients in each group). At Week 16, placebo patients with <10% improvement from baseline in both swollen and tender joint counts were switched to REMICADE induction (early escape). 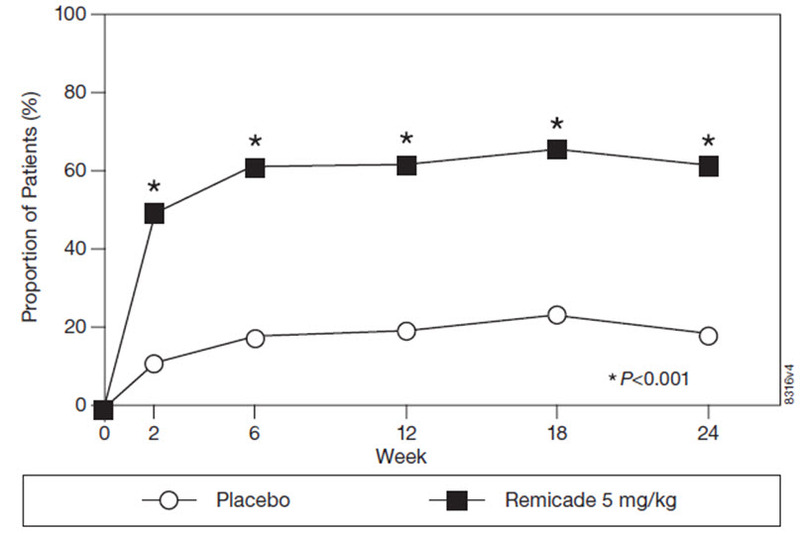 At Week 24, all placebo-treated patients crossed over to REMICADE induction. Dosing continued for all patients through Week 46. Improvement in Psoriasis Area and Severity Index (PASI) in psoriatic arthritis patients with baseline body surface area (BSA) â‰¥3% (n=87 placebo, n=83 REMICADE) was achieved at Week 14, regardless of concomitant methotrexate use, with 64% of REMICADE-treated patients achieving at least 75% improvement from baseline vs. 2% of placebo-treated patients; improvement was observed in some patients as early as Week 2. At 6 months, the PASI 75 and PASI 90 responses were achieved by 60% and 39%, respectively, of patients receiving REMICADE compared to 1% and 0%, respectively, of patients receiving placebo. The PASI response was generally maintained through Week 54. [see Clinical Studies (14.8)]. Physical function status was assessed using the HAQ Disability Index (HAQ-DI) and the SF-36 Health Survey. REMICADE-treated patients demonstrated significant improvement in physical function as assessed by HAQ-DI (median percent improvement in HAQ-DI score from baseline to Week 14 and 24 of 43% for REMICADE-treated patients vs 0% for placebo-treated patients). During the placebo-controlled portion of the trial (24 weeks), 54% of REMICADE-treated patients achieved a clinically meaningful improvement in HAQ-DI (â‰¥0.3 unit decrease) compared to 22% of placebo-treated patients. REMICADE-treated patients also demonstrated greater improvement in the SF-36 physical and mental component summary scores than placebo-treated patients. The responses were maintained for up to 2 years in an open-label extension study. The safety and efficacy of REMICADE were assessed in 3 randomized, double-blind, placebo-controlled studies in patients 18 years of age and older with chronic, stable plaque psoriasis involving â‰¥10% BSA, a minimum PASI score of 12, and who were candidates for systemic therapy or phototherapy. Patients with guttate, pustular, or erythrodermic psoriasis were excluded from these studies. No concomitant anti-psoriatic therapies were allowed during the study, with the exception of low-potency topical corticosteroids on the face and groin after Week 10 of study initiation. • Patients with missing data at Week 10 were considered as nonresponders. • Patients with missing data at Week 10 were imputed by last observation. The groups that received a maintenance dose every 8 weeks appear to have a greater percentage of patients maintaining a PASI 75 through Week 50 as compared to patients who received the as-needed or PRN doses, and the best response was maintained with the 5 mg/kg every 8-week dose. These results are shown in Figure 4. At Week 46, when REMICADE serum concentrations were at trough level, in the every 8-week dose group, 54% of patients in the 5 mg/kg group compared to 36% in the 3 mg/kg group achieved PASI 75. The lower percentage of PASI 75 responders in the 3 mg/kg every 8-week dose group compared to the 5 mg/kg group was associated with a lower percentage of patients with detectable trough serum infliximab levels. This may be related in part to higher antibody rates [see Adverse Reactions (6.1)]. In addition, in a subset of patients who had achieved a response at Week 10, maintenance of response appears to be greater in patients who received REMICADE every 8 weeks at the 5 mg/kg dose. Regardless of whether the maintenance doses are PRN or every 8 weeks, there is a decline in response in a subpopulation of patients in each group over time. The results of Study I through Week 50 in the 5 mg/kg every 8 weeks maintenance dose group were similar to the results from Study II. American Thoracic Society, Centers for Disease Control and Prevention. Targeted tuberculin testing and treatment of latent tuberculosis infection. Am J Respir Crit Care Med 2000;161:S221â€“S247. van der Heijde DM, van Leeuwen MA, van Riel PL, et al. Biannual radiographic assessments of hands and feet in a three-year prospective follow-up of patients with early rheumatoid arthritis. Arthritis Rheum. 1992;35(1):26â€“34. van der Linden S, Valkenburg HA, Cats A. Evaluation of diagnostic criteria for ankylosing spondylitis. A proposal for modification of the New York criteria. Arthritis Rheum. 1984;27(4):361â€“368. Schroeder KW, Tremaine WJ, Ilstrup DM. Coated oral 5-aminosalicylic acid therapy for mildly to moderately active ulcerative colitis. A randomized study. N Engl J Med. 1987;317(26):1625â€“1629. Turner D, Otley AR, Mack D, et al. Development, validation, and evaluation of a pediatric ulcerative colitis activity index: A prospective multicenter study. Gastroenterology. 2007;133:423â€“432. Store unopened REMICADE vials in a refrigerator at 2ºC to 8ºC (36ºF to 46ºF). Do not use REMICADE beyond the expiration date located on the carton and the vial. This product contains no preservative. [For storage conditions of the reconstituted product, see Dosage and Administration (2.11)]. Patients or their caregivers should be advised of the potential benefits and risks of REMICADE. Physicians should instruct their patients to read the Medication Guide before starting REMICADE therapy and to reread it each time they receive an infusion. It is important that the patient's overall health be assessed at each treatment visit and that any questions resulting from the patient's or their caregiver's reading of the Medication Guide be discussed. Some people receiving TNF-blockers, including REMICADE, developed a rare type of cancer called hepatosplenic T-cell lymphoma. This type of cancer often results in death. Most of these people were male teenagers or young men. Also, most people were being treated for Crohn's disease or ulcerative colitis with a TNF-blocker and another medicine called azathioprine or 6-mercaptopurine. See the section "What are the possible side effects of REMICADE?" below for more information. Rheumatoid Arthritis - adults with moderately to severely active rheumatoid arthritis, along with the medicine methotrexate. Crohn's Disease - children 6 years and older and adults with Crohn's disease who have not responded well to other medicines. Plaque Psoriasis - adult patients with plaque psoriasis that is chronic (does not go away), severe, extensive, and/or disabling. Ulcerative Colitis - children 6 years and older and adults with moderately to severely active ulcerative colitis who have not responded well to other medicines. REMICADE blocks the action of a protein in your body called tumor necrosis factor-alpha (TNF-alpha). TNF-alpha is made by your body's immune system. People with certain diseases have too much TNF-alpha that can cause the immune system to attack normal healthy parts of the body. REMICADE can block the damage caused by too much TNF-alpha. have an infection (see "What is the most important information I should know about REMICADE?"). have recently received or are scheduled to receive a vaccine. Adults and children receiving REMICADE should not receive live vaccines (for example, the Bacille Calmette-Guérin [BCG] vaccine) or treatment with a weakened bacteria (such as BCG for bladder cancer). Children should have all of their vaccines brought up to date before starting treatment with REMICADE. If you have a baby and you were receiving REMICADE during your pregnancy, it is important to tell your baby's doctor and other health care professionals about your REMICADE use so they can decide when your baby should receive any vaccine. Certain vaccinations can cause infections. If you received REMICADE while you were pregnant, your baby may be at higher risk for getting an infection. If your baby receives a live vaccine within 6 months after birth, your baby may develop infections with serious complications that can lead to death. This includes live vaccines such as the BCG, rotavirus, or any other live vaccines. For other types of vaccines, talk with your doctor. See "What is the most important information I should know about REMICADE?" Children who received REMICADE in studies for Crohn's disease showed some differences in side effects compared with adults who received REMICADE for Crohn's disease. The side effects that happened more in children were: anemia (low red blood cells), leukopenia (low white blood cells), flushing (redness or blushing), viral infections, neutropenia (low neutrophils, the white blood cells that fight infection), bone fracture, bacterial infection and allergic reactions of the breathing tract. Among patients who received REMICADE for ulcerative colitis in clinical studies, more children had infections as compared with adults.